Is New Delhi’s decision to reject all foreign financial assistance to deal with Kerala’s unprecedented flood havoc the right decision? A controversy is raging in the midst of the worst-ever natural calamity in Kerala. Even some former Foreign Secretaries like Lalit Mansingh, Shiv Shankar Menon and Nirupama Rao (the last two hail from Kerala) have questioned the rigid policy pointing out that earlier India had accepted foreign donations when earthquakes struck Uttarkashi (1991), Latur (1993) and Gujarat (2001) and during the Bengal cyclone (2002) and Bihar floods in May 2004. While the Modi government claims that it has inherited this policy of ‘no foreign aid’ from the Manmohan Singh government, the Kerala chief minister and the Left parties demand that policies should be flexible. Even Union Tourism Minister K J Alphonse has been pleading that a ‘one-time exception’ should be made to meet the huge flood havoc. The Manmohan Singh government had taken a decision at the time of the devastating tsunami in 2004 when it had politely refused foreign aid claiming that India would rebuild with its own funds. He maintained the same stand during the devastating 2013 Uttarakhand floods as well as the Kashmir floods the next year. Indeed the August floods in Kerala, the worst since 1924, have claimed 410 lives, besides rendering over 14 lakh people homeless.Over 10,000 kilometers of highways have been destroyed. About 100,000 buildings have been damaged and thousands of acres of crops have been lost. Rs.2.2 billion will be required to rebuild the Kochi airport alone. While some estimates put the required amount at Rs 21,000 crores, the state government has sought Rs 2,600 crores from the Centre just for relief. The Modi government has so far sanctioned Rs 600 crores and has promised more. Alphonse, the only minister in the Modi cabinet from Kerala, has confirmed that they would need ‘huge, huge’ funds to rebuild the state. As the Union Tourism minister he is also concerned that tourism, which is one of the major sources of income for ‘God’s own country’ will be badly affected. No doubt the whole country is shocked by the enormity of the calamity and most states have come forward with financial assistance and also relief materials. People in other parts of the country have also come up with liberal assistance by donating to the Chief Minister’s relief fund. 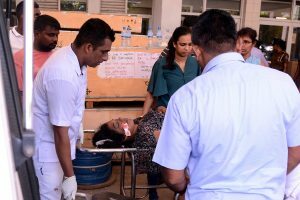 The Centre is also trying to help Kerala get aid from international agencies. But is that enough? In the midst of this tragedy, a controversy has arisen after the Centre rejected the UAE offer of Rs 700 crores as aid. Qatar’s ruler has offered Rs 35 crore and the neighboring Maldives has offered $50000. More offers are pouring in. There is outrage in social media as well as in Kerala and elsewhere that the state needed all the assistance it could get. The Left parties have pointed out that while rejecting the UAE offer, the Centre has given only Rs 600 crore as immediate relief. While Congress President Rahul Gandhi has demanded that it be declared a ‘national calamity’, the Modi government has called it as ‘a calamity of severe nature’. The UAE alone has about three million Indian labour of which 80 per cent are from Kerala. The controversy arose after the Ministry of External Affairs stated: “In line with the existing policy, the Government is committed to meeting the requirements for relief and rehabilitation through domestic efforts.” Critics note that while rejecting foreign assistance, New Delhi did not hesitate to come to the rescue when natural calamities struck in Philippines, Nepal, or even the Katrina disaster in Arkansas or to the neighboring countries when they faced nature’s fury. Should the Centre be so rigid in rejecting foreign donations? 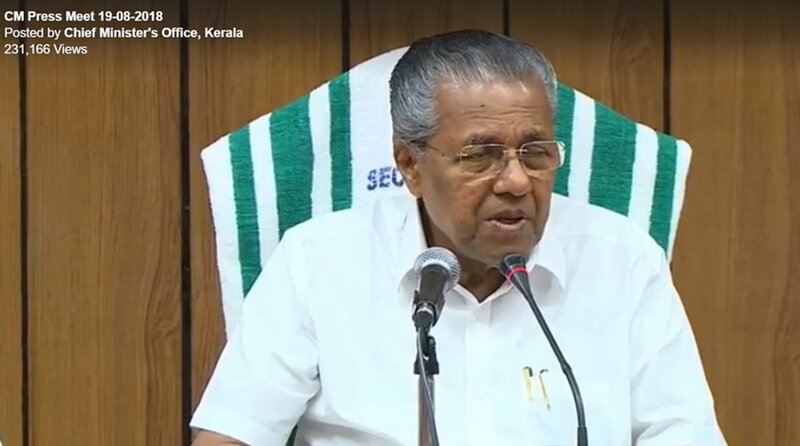 Kerala chief minister Pinarayi Vijayan quotes the Modi’s government’s 2016 national disaster management policy, which says in chapter 9, “If the national government of another voluntarily offers assistance as a goodwill gesture in solidarity with the disaster victims, the central government may accept the offers.” So there is room for a one-time exception. After all no policy can be rigid; it can always be changed or amended. The government should sense the mood of the people in implementing policies. There is a distinction between foreign aid for developmental works and humanitarian assistance. The offer of aid from foreign countries to Kerala should be treated as falling in the latter category. After all, humanitarian aid has no borders.